If anyone is interested in pursuing that car and redoing it they should contact John in RI. He has a roll of that color spectrum fabric still. I just purchased some fabric in the brown for $31. The piece was 3 rows wide and 62" long which is the width of the roll. I plan on holding onto it until I can build a car for my son. I missed getting the red at $18 and the blue for $41. I plan on continuing my search for the grey. Grey is on ebay right now but not for 31 bucks lol. Guy wants 150 for the piece. If you really want it you can get it from Original auto interiors in Michigan for around 86. Thats the cheapest ive seen it. Its been awhile since i posted updates with my interior. Ive been busy on other things. But towards the end of the summer i finally finished off the interior (finished off the car too). here are two shots of the door panels. Also got a better power seat switch from ebay. In the '80's I just simply hated this interior. I thought it was gaudy and tasteless, and on top of that I really didn't even find the "Conteur" seats all that comfortable. Now, that interior is a selling point when I'm looking at 3rd gens. Here's another irony. When new, I hated Crossfire because it was slow, couldn't beat a Mustang GT and it's worse sin - not available with a stick. Now I have one. And if I run across a blue CAMARO CAMARO CAMARO interior for it, I'll probably snag it too. Id probably sell you mine. 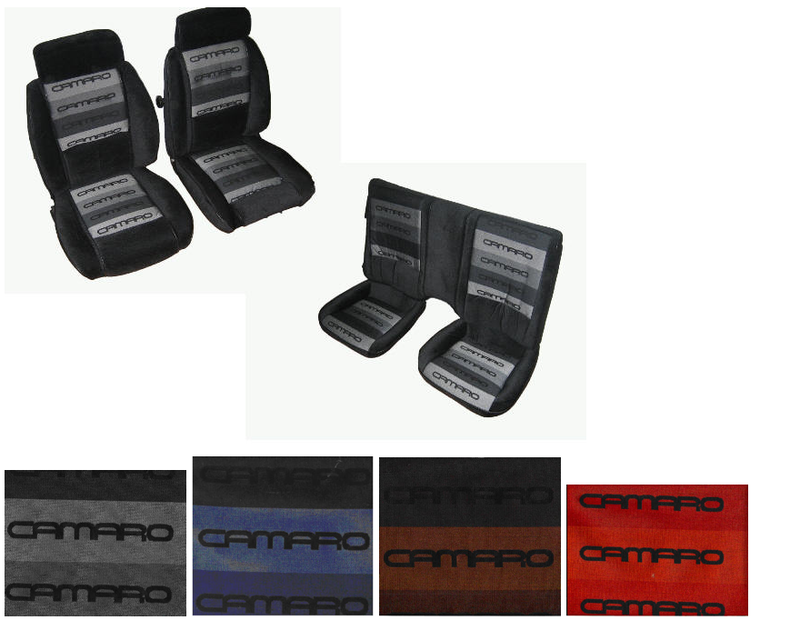 ive got a set of the blue camaro camaro camaro conteur seats in good condition what is the going price for them? To add to what ratpack said..when i got mine i knew they needed recovering. I paid i think 200 for the front two seats along with the fabric to recover my entire interior. There is nothing special about the back seats other than the fabric so if you only find the front two just get enough fabric to redo the back seats as well. But keep in mind i didnt get let off easy. When all is said and done i think i have about a 1000 in my interior since ever seat needed to be recovered along with the conteur door panels. Was it worth it..i think so but i could have also used that money in a lot of other areas. Is the RPO for contour seats in 1985 ZO6 as some think or is it the "D" or "E" after the color number? Here is where I found my information on these interiors' RPOs. Darth 93 Your interior is the base vinyl with the LS seat option which when ordered without the Custom Interior you got the standard vinyl door panels as shown in your picture. Ordering the LS interior this way cost $375.00, but when combined with the Custom Interior you got the matching cloth door panels. The cost of the option jumped up to $650.00, so for the extra $275.00 you got the door panels and the BS1 Quiet Sound Group which was included with the Custom Interior. 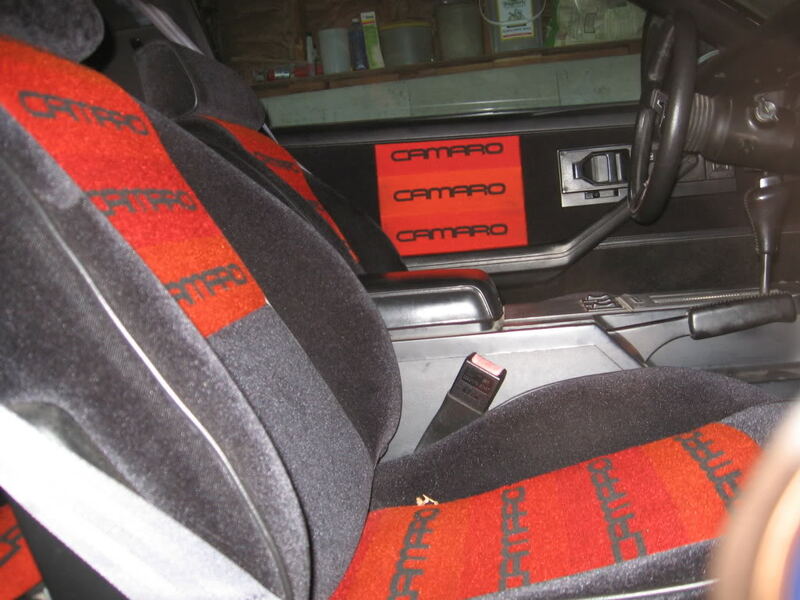 The only way the matching cloth panels were included with the seats in 83 & 84 was with the Custom Interior option. Then in 85 the LS Interior was only available with the Custom Interior. Check your interior code on the trim tag secured to the radiator support, it should probably be 67E. Thank you so much Rat PacK. My car is a 67E. Just clears up the mystery in my own mind that my car is correct as is. I did buy some material from John in RI. One of these days will create a set of door panels ( but keep the originals ) The history on the Miss USA Pagent cars is intersting too. Just bought a blue Conteur interior today. Seats need to get recovered. The door panels are the base vinyl. 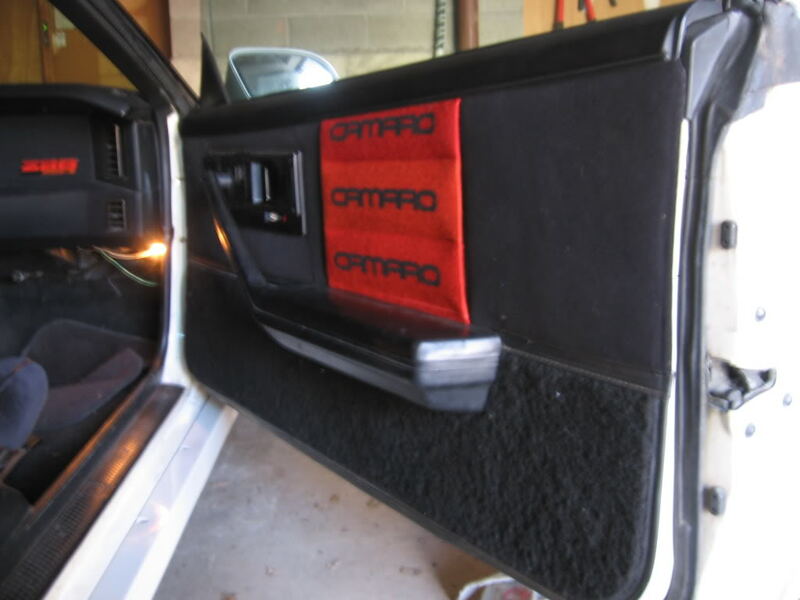 If I want to recreate the CAMARO CAMARO CAMARO door panels with the carpeted lower half, what do I need to do? 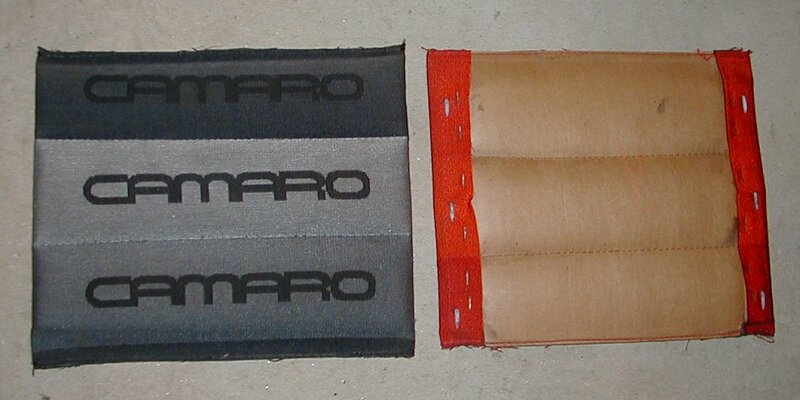 The CAMARO logos on the door panels are made as an "insert" and simply installed on a solid door panel. The fabric gets stiched over padding and onto cardboard. On the back,...... Each side has a length of thin steel (with some 'teeth' punched out of them ) pinned down the side. A Picture would do a better job of describing them !! 1) yes my '83 has a blue custom interior, so I can recycle those door panels - right? 2) Does the blue cloth go across the top of the panel and then the CAMARO insert goes over it, or does the CAMARO insert go on and then the blue cloth fills-in in front and behind the insert? 3) John, do you make those inserts? Last edited by chazman; 03-26-2010 at 08:31 PM. 3.) yes to the first part of your question, no to the last. No he doesnt. He just happens to have one of the better collections of early third gen conteur stuff around cause he loves em just as much as i do. I do not believe he has any blue conteur fabric left however someone on ebay not too long ago had a set for sale for around 100 bucks for enough to do an interior. What is the correct way to attach these panels to the door panels? If you look at the red/orange panel on the right side of the picture you can see the 3 clips on each side of the back. The panels basically just hang on the door panel with these clips. Those clips go all the way through to the backside of the door panel. Wow, never knew that. Do those clips go into anything or do you just sort of jam them into the door panel? Found it while surfing the web tonight. Might help someone out. Somewhat pricey but cheaper than having an upholstery shop make the covers. Just an FYI, I contacted Desert Sun to inquire about the CAMARO door inserts. He says he can make a new pair for $75. Which are the "correct" seatbelt guides which screw into the headrest? I've seen a couple different ones. I also got some fabric samples from Original Interiors. Looks very high quality, but the color is substantially darker than my seats. And I don't mean just from fading either. 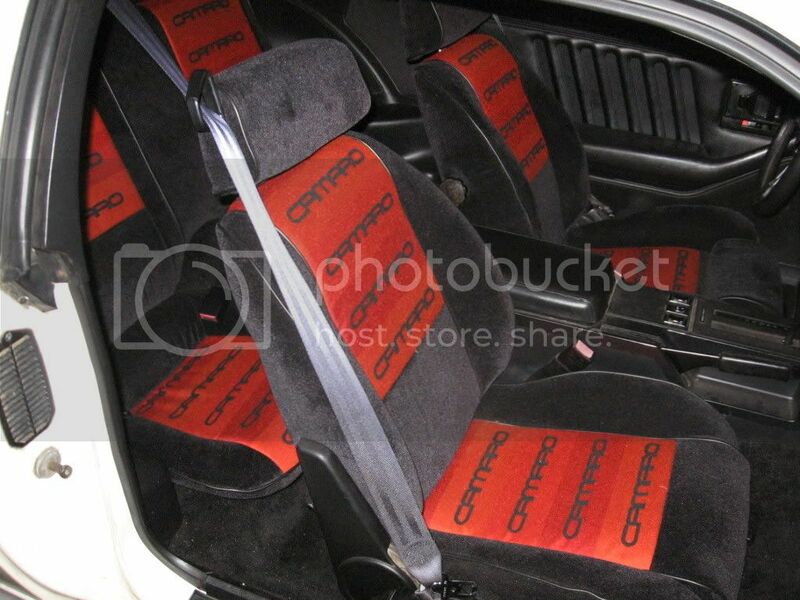 I was just going by the pictures of what everones interior showed and used the stock black seat belt guides from my original camaro seats. They are the squarer ones. Here is one of the better pictures showing what i have. There is nothing special about them or the headrests on the LSCs in fact. GM used the same headrest in the normal headrest camaro seats as well as buicks, oldsmobiles and others. The ones I have on my 83's seats are the L shapes ones. I was think of re-using those, but if the square ones you have are correct I'll look around for a blue pair somewhere. I have a set of Tan ones (1985) and they also have black guides. Also, they're for sale. Last edited by 89junkyardgta; 04-14-2010 at 12:25 PM. I have a set of Tan ones (1985) and they also have black guides. I was actually surprised that they were blue. I would have thought that gm would have wanted to save costs and have them black. Never really paid attention to them to be honest. Good luck finding a set of blue ones though...if i were you i would just find a set of square style ones and dye them blue. 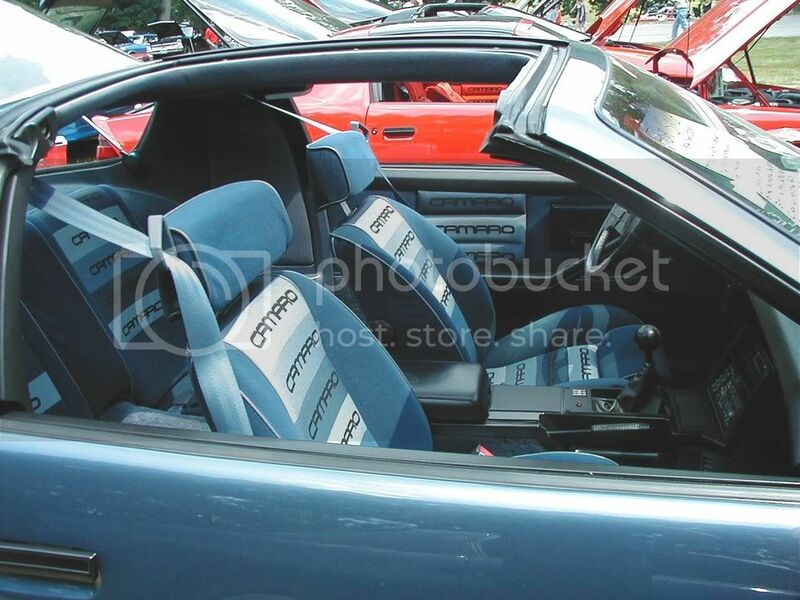 What i would do as far as door panels is get a set of factory conteur door panels so that you can get that panel that has the three camaros on it for the upholsterer. Heres a set on ebay right now in burnt orange. It all comes down to what u want to spend. I had both door panels redone in my custom interior for 100 bucks. Blue is tough to find. You can still buy them new, but I've seen them in black/tan/gray/red - not blue yet. Yeah, I've got my eye on that one. Last week there was another orange/red pair for half the price of those. But.......ya never know......a blue one could turn up. I've seen them out there before I was looking to buy. I've only been seriously looking for a couple of weeks now. 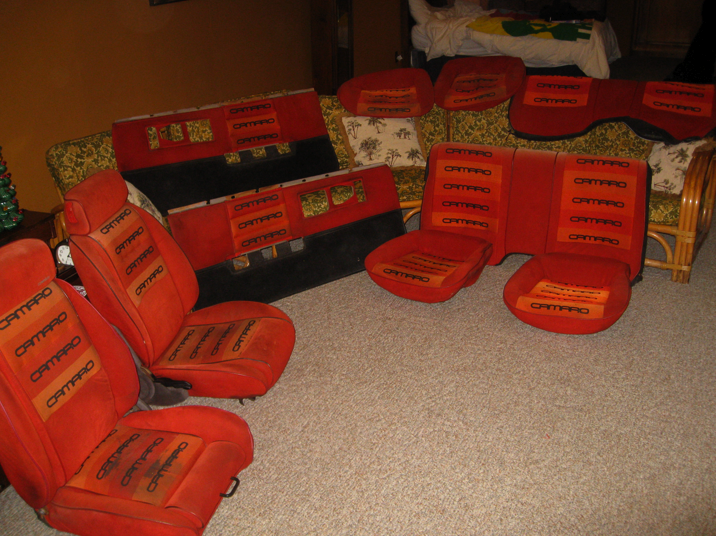 How much did it cost you to reupholster your front seats? Grand total of 1000 on the dot. Ug i need a beer after reading that myself lol. Problem is that does not exist unless its tied to an equally mint car. The only time ive heard of a mint set was one that a dealership pulled out of a car when new i think and stored away. That was selling for several 1000s so there is really no cheap way to get this interior nice unless u buy the whole nice car which probably isnt cheap either lol. I think you're right. If you want this interior and you want it mint - you'll need to pay. Now, I think I need a drink! Last edited by chazman; 04-14-2010 at 01:59 PM. yeah you can.. Hawks Thirdgen sales them new. heres the link..
Hey Sid, I seem to remember a post where you said you reupholstered the bolster on your driver's seat. Where did you get your fabric? Well i got very lucky and found a guy that had my same 1983 camaro and with my interior. The guy said he was making his car into a pro street and was taken the interior out. He thought the interior was ugly and didn't want it. So i bought it off him for $100. I got a hell of a deal. lol I got all the seats and door panels. hahaha.. I think I'm only lucky with cars because i never have luck like this. I'm finding the same thing. I've ordered a couple of sample swatches of the blue for the bolsters and it's way darker. Any luck finding the lighter blue? I did a little experiment. These are the Conteur seats I bought a couple of weeks ago. This is them after about 5 hours of cleaning. Yuk! Anyway, look at the CAMARO pattern on on the seat back of the driver's seat. It was almost as bad as the seat bottom, basically COMPLETELY trashed, worn and beyond repair. Soooo, I figured what the heck, I've got nothing to lose. I painted it. I paint military miniatures as another hobby, so I had paints I could mix and blend on hand. I'm still working on it, and it needs afew touch ups and refinements, but what do you all think? Last edited by chazman; 04-17-2010 at 07:40 PM. As far as the picture goes it looks pretty good. I don't know if it translates that well in person. I have those rear seats if you want them. They're as nice as the passenger seat back that you're showing. Thanks. Actually, I think it looks at least as good in person. When I get a chance, I'll do the bottom and post a pic. Thanks for the offer on the rears, but I have all four seats. Just need the door panels. Wow, that really shows that these cars are really starting to become collectable. A few years back you would never see such a niche market for a 4 year option. And I'll bet that the material is new and not NOS. While I'm speaking about it, has anybody noticed an increae in the numbers of 3rd Gens in their area? I've seen a marked increase in my area since the arrival of the new Camaro. I'm seeing at least 5 or 6 different 3rd gens where I live, as if they became popular again. 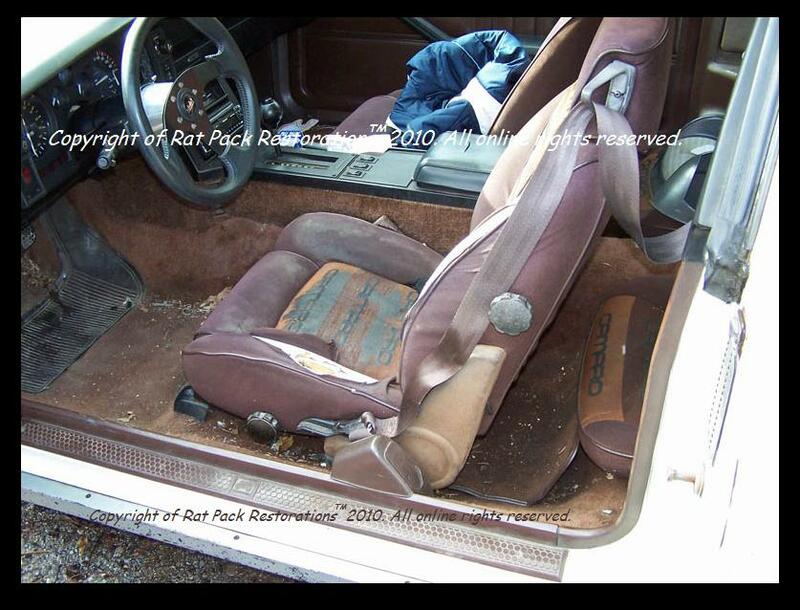 OK, no problem, but you could salvage the material from the seats to make the door panels....Just a thought!!!! Anyone ever use Desert Sun? It's listed on the first page. He says he can make a pair of front seat covers for $500. Is that worth it? Hawks has all four seats for about $650, but won't do the fronts seperately. I believe these are the stock seatbelt guides for my seats. I've never seen this type before. My headrests have the base still attached with the triangle thingy missing. Anyone know where I can get a pair of those?